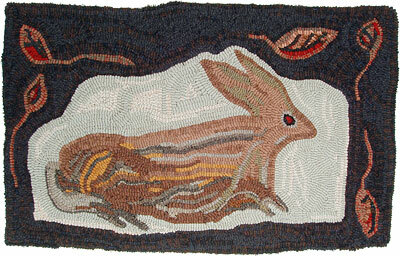 Red Leaf Rabbit continues my delight in making rabbit rugs. This rug uses a dark irregularly shaped border, with long stemmed flowers that echo the reds in the rabbit's eye and oranges in its fur. It's as if one has had the good fortune to glimpse a silent rabbit through dark forest leaves. The wildness of color in the rabbit's fur plays off the dark background. As in all of my work, the black is not just black, but a mixture of many darks, the fur in not just brown, but a play of numerous colors and textures. While a little wild looking, this rabbit rug contains a love of 19th century rug work while being much its own creation.